This download is a simple fix for the bug. 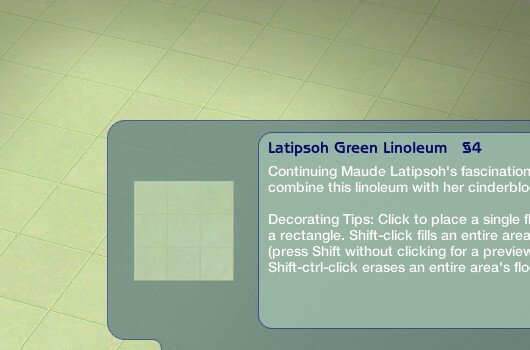 Just place the package file into your Download folder and the Maxis floor should work correctly again. This download does not add a custom floor to your game, it simply overrides one game file to make the original floor work correctly. You uninstall it simply by removing the file from your Downloads folder. You should only need this fix if you have both University and Seasons installed. It other game configurations this download should not cause any harm, either, but it will be useless. 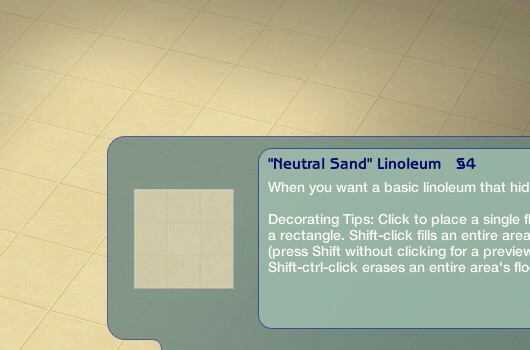 Edited to add: This download does not replace the Neutral Sand Linoleum, you should have both of the floors working correctly. Without the fix, you likely have two copies of the Neutral Sand and none of Latipsoh green. This fix only returns the floors to the way they used to be before Seasons. The catalog image will not be automatically updated, though. You can fix it by placing your mouse cursor over the image and right-clicking while holding down the CTRL key. 328 people have said thanks to IgnorantBliss for this download.